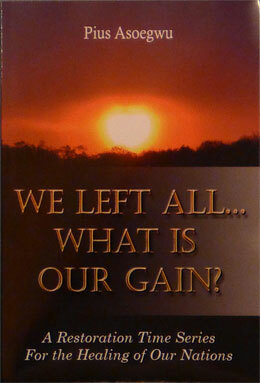 "We Left All... What Is Our Gain?" In the word of the bible, the book of God, it is said that, "Sin will be rampant everywhere, and the love of many (of god's followers for God and His Business and for one another) will grow cold but he that endures (holds on) to the end will be saved." Matthew 24:12-13.You and I are witnesses to this prophetic Truth from Jesus' Mouth fulfilling in our time. So in dealing with this situation as shown by the title of this book, we are focusing on stirring enthusiacism through our unique way to motivate every reader to pick up courage in their running the race that we are called unto to a finish irrespective of the challenges of our time; looking unto Jesus the Author and the finisher of our faith. We wish that every reader will persevere and endure whatever may come his or her way, staying strong on the path of righteousness. So we say to all, examine yourself and see whether you are properly in the faith, to hold on to the profession of his or her faith and do not allow anything or any person to rob them of the glorious crown which the Lord has prepared for them who love Him. I wish you Restoration in the Lord!!! You can also purchase locally if close to Saint Albans, WV. Call (304) 727-9880 for more information. 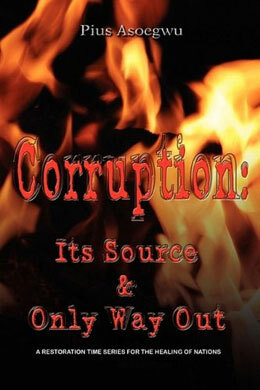 "Corruption: It's Source and Only Way Out"